Have you gotten a copy of Dana’s new book? I just received my copy in the mail this week and am so excited to put it to good use. There is seriously a ton of information in here! Fabrics that I have never even heard of before are listed. This is not a project book, but is a good resource to have as a user of fabric because she gives the definition of the fabric type and then lists the properties, advice for working with that fabric and how to care for it properly. And the book is a nice purse size- perfect for taking with you on your trip to the fabric store. Even better, Deborah had a book signing party for Dana last night and my sweet hubby said we could take a day trip to Atlanta so that I could attend! Isn’t he the best? 🙂 His brother and sister are visiting with us this week and we had loads of fun visiting Ikea, walking around the Olympic park, and of course having fun at Whipstitch (or maybe the last part was just me 🙂 ) I loved meeting Dana. She is just as sweet and down-to-earth in person as she seems on her blog. This had been a great year for me! Back in March, I got to meet Rae and Karen and now I have met Dana! It is so fun to connect with people after reading their blogs for years. It also makes me feel less like a stalker when I have met them in person. 😉 I hope to continue to be able to meet more blog friends as the opportunity arises. 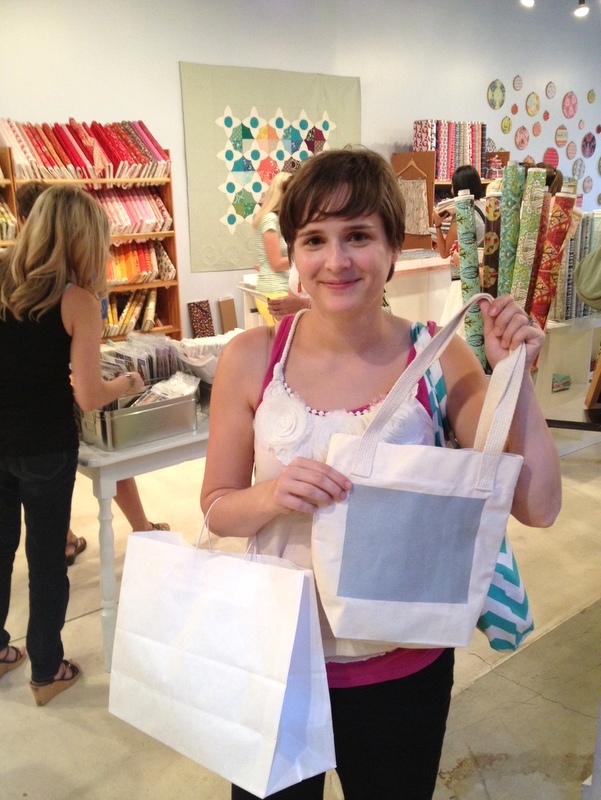 It was also great to officially meet Deborah after taking the online quilting class from her in June. Oh, and Ian won a door prize for me so I took home a tote bag made by Dana with some Forever 21 goodies- sunglasses and headbands: score! Of course, you must note that my new purse made it into the pictures and I picked up a few goodies at Whipstitch that I hope to using in some upcoming projects…hopefully you will see them soon! This entry was posted in Personal, Selfish Sewing and tagged atlanta, danamadeit, fabrics a-z, whipstitch by oliver's fancy. Bookmark the permalink.